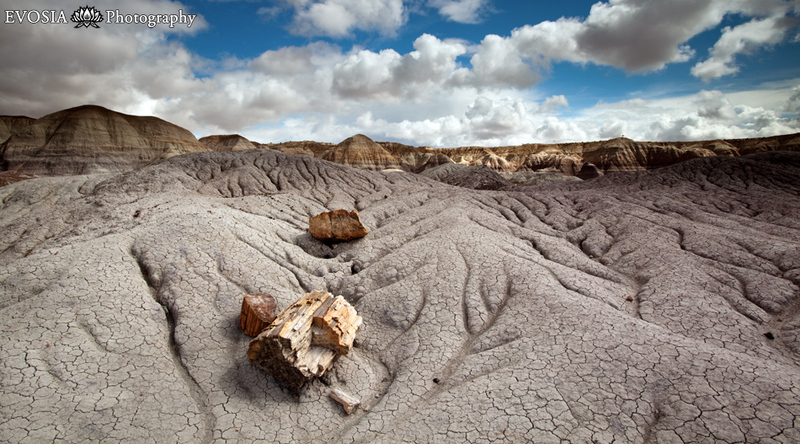 The Petrified Forest is known for its very colorful petrified wood. Most of the wood have crumbled into little bits but there are still large pieces lying around. The area is huge but the park has limited hours to prevent people from coming in late at night to steal some of the petrified wood. Still, there are stores outside the park where you can legally purchase some. I almost didn’t stop here but I’m so glad I did. I was on my way from Canyon De Chelly to the Grand Canyon. Saw that a winter storm was moving through the Grand Canyon until the afternoon so I made a stop here to wait things out. Arrived late morning and stayed until mid afternoon. Weather wise, it started depressingly overcast, then occasional rain/sleet, then the sun came out with some really dramatic clouds. That made the stop worth while. In Blue Mesa the weather made the place even more other-worldly. Still, it was tough lighting. Spots of cloudy plus spots of bright sun. From time to time, I had to wait for clouds to block the sun before shooting. The direct sun makes the lighting too harsh and bright, washing out softer colors and subtle details. Light and weather conditions really make a huge difference here — more so than any of the other places I visited. I was up in the Painted Desert area when it was just overcast and my photos were flat and dull. If I had turned back at that point, I would have wrote this place off. I think the best times to be here are sunset (best), sunrise, or interesting weather like this. I feel really very lucky to have captured these images during mid-day. Thank you mother nature! I hope to return here again to see a sunset light up the Painted Desert. Posted on Sunday, February 28th, 2010 at 6:38 pm. Filed under: Landscapes, Photography, Portfolio Tags: arizona, painted desert, petrified forest national park, petrified wood	RSS 2.0 feed.